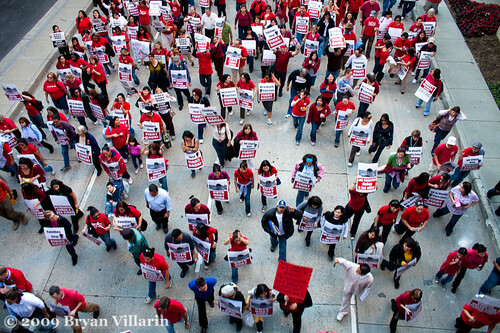 We joined the growing crowd at the LAUSD headquarters before streets were starting to get blocked off. Around 3:30pm, it got packed out. Finally, the bullhorn-equipped leaders led the crowd from the back of a flatbed truck, surrounded by huge speakers powered by a generator. As we got closer, we saw that a huge crowd already formed. A stage was set, a row of news vans were parked, helicopters were hovering, and police/safety officials were everywhere. Leslie Miller from ABC7 Eyewitness News was at the entrance of Pershing Square. I think they were having camera issues, plus one person was harassing her a bit. I made my way through the crowd, trying to capture a few more photos before we took off. There were some stands mocking Governor Arnold Schwarzenegger with pamphlets and forms to fill out. A lot of people were seated on steps and benches, looking tired and fed up. We didn’t stay for too long at Pershing Square. I simply wanted to capture the massive crowd. I hope something positive came from this.